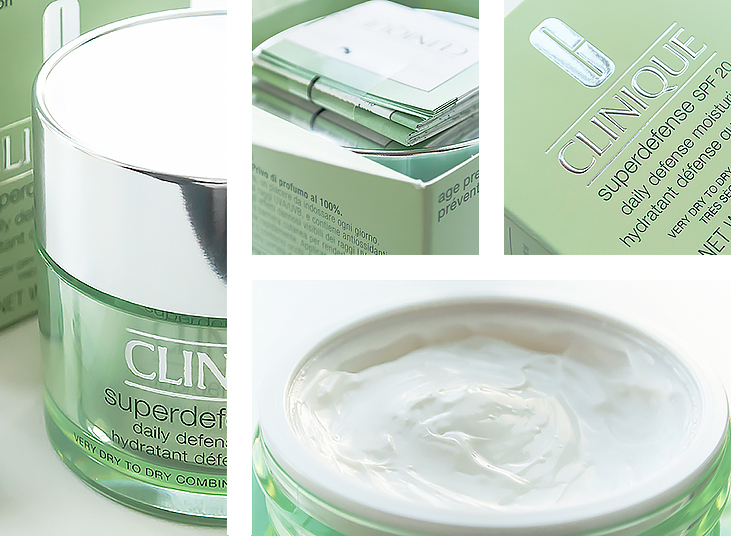 I can best describe the new Clinique Superdefense SPF 20 Daily Defense Moisturizer as a meal for the skin. 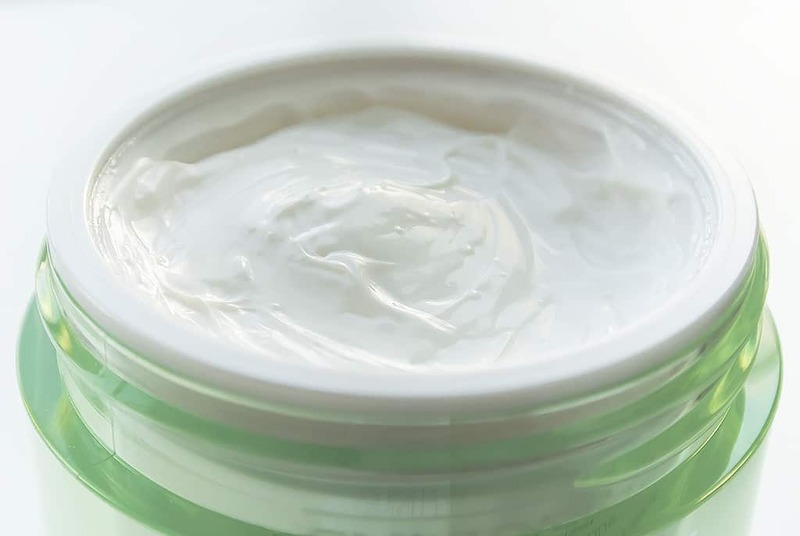 Entirely reformulated with new ingredients and a gorgeous new melting, cream texture for all skin types concerned with the first signs of ageing. It comes in Very Dry to Dry Combination (Skin Type 1 & 2) and Oily to Very Oily (Skin Type 3 & 4) formulations. Clinique knows that 80% of skin ageing is caused by UV radiation and exposure and have therefore formulated Superdefense SPF 20 Daily Defense Moisturizer with Photosomes – the enzymes that harness the energy from UV radiation to repair damage to the skin before lines and wrinkles appear. Barley and Wheat Germ extracts aid in barrier repair to lock in moisture and balance surface oil whilst Sea Whip Extract and Caffeine calm the skin and reduce irritation. The delicious antioxidant protection comes in the form of Vitamin E and brightening / conditioning Vitamin C.
On first contact, Clinique Superdefense SPF 20 Daily Defense Moisturizer feels quite thick and you can’t help feeling there’s a distinct possibility that it’s going to be too rich on the skin. However, as soon as it comes into contact, it melts in and instantly disappears, leaving you feeling well hydrating but not greasy or heavily covered in product. Throughout the day, as long as your other skincare is doing its job, you should stay looking fresh, dewy and with a healthy glow as opposed to shiny and greasy. You can use this on its own but it’s also been designed to work with the Clinique 3-Step Skincare System and is applied after your Dramatically Different Moisturising Lotion which should stress how thick this product isn’t! 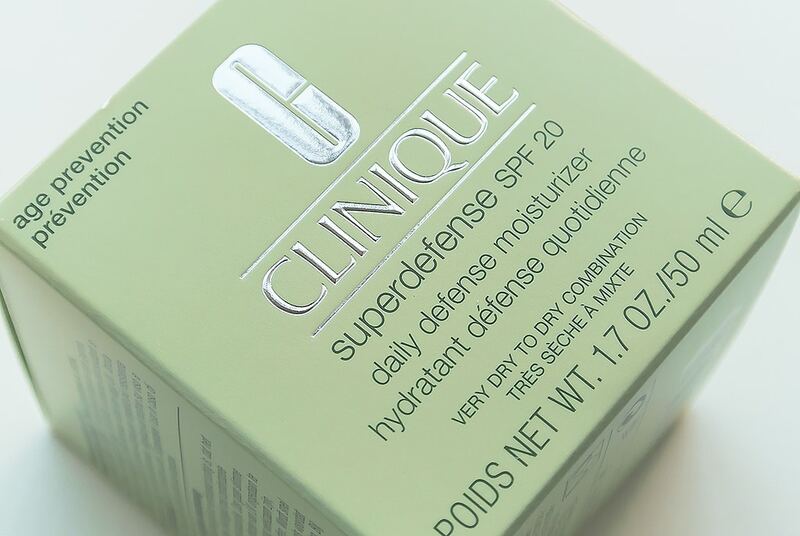 I was a big fan of the old Superdefense but the new Superdefense SPF 20 Daily Defense Moisturizer is definitely a winner. I always find that after all the hundreds and thousands of products I’ve trialled for you guys over the last (almost) 3 years, that whenever my skin throws a wobbly, it’s always Clinique that’ll save it. I don’t think I can give a higher recommendation really? 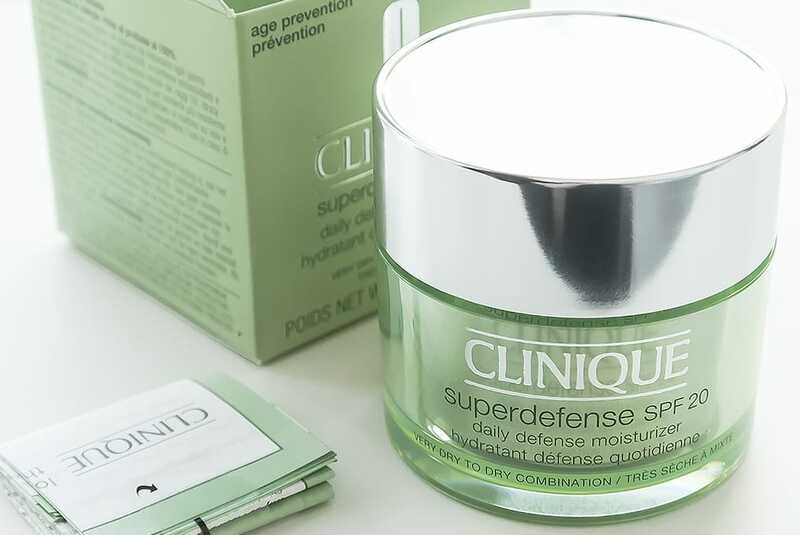 So, Clinique Superdefense SPF 20 Daily Defense Moisturizer is available for £39.00 for 50ml here, direct from Clinique. This article first appeared on MANFACE written by Thom Watson. It was published on Monday 10th February 2014 and was last updated on Monday 3rd April 2017 at 2:12pm. 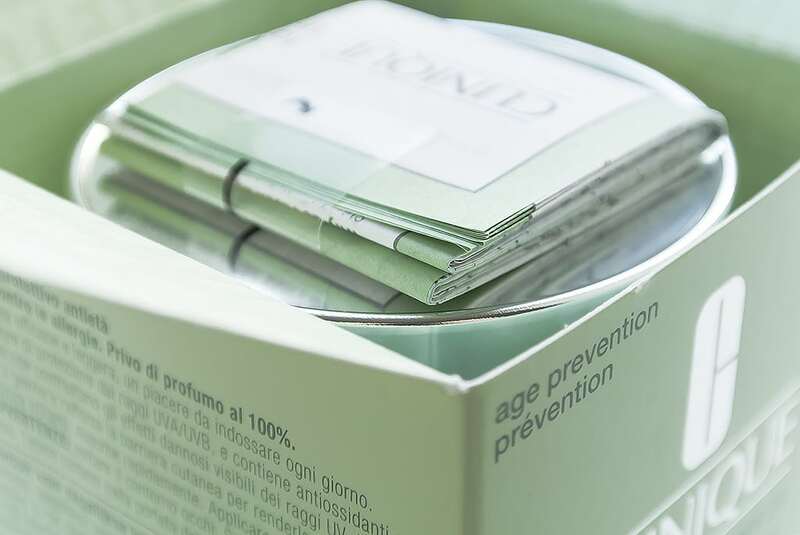 It's categorised under Anti-Ageing, Clinique, Moisturise, Sensitive Skin, Sun Protect where you'll find more related content. May I just say what a relief to find someone that actually understands what they’re discussing online. stripes, or prints. -If laying on a solid floor, laying a damp proof membrane is advisable. a lot more well-favored than you might be right now. You are very intelligent. Decent review, but like so many others you skip the very important issue in our time and age; is it paraben-free? Clinique doesn`t get a high rating from me before they enclose a full ingredients list. The enclosed papersheet did not content anything else than uninteresting boatfulness about their own product. I expect a more serious attitude towards parabens in 2015.
a bat and ball which is slightly smaller than the ball of your baseball game. I am so dissapointed with the new superdefense spf20 after many years of using the spf25 original moisturiser this replacement is awful and left my skin uncomfortable and tight! Having used for a few days I had to return to the shop and feel really upset about the prospect of finding another moisturiser to replace this. I had so many compliments about my skin while using the original product , and also recommended it to my closest friend who like me had the same problem. Please re introduce the original SPF 25 it was so much better and reading the reviews it seems a lot of other people feel the same.